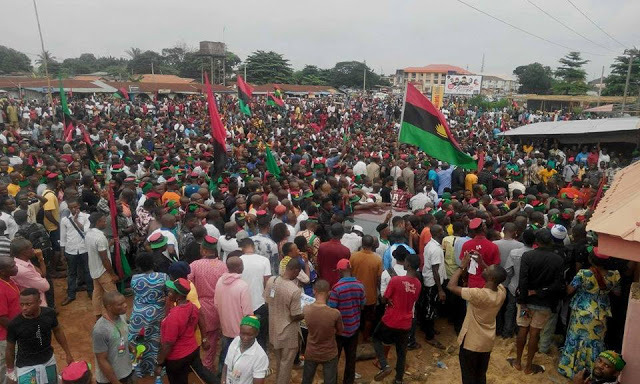 We, the worldwide family of the Indigenous people of Biafra (IPOB) once again warn anybody contemplating attending the Fulani sponsored restructuring jamboree to think twice before heading to Awka, on Monday because their safety will not be guaranteed. The statement issued by one Fulani police officer SP Mohammed Haruna Idris yesterday in Awka confirms what we had always known that Ohanaeze Ndigbo will rely on their northern masters to protect them. A socio-cultural association relying on their oppressors to come and protect them is a disgrace. The Fulani controlled Nigeria Police and Army have made it clear their armored tanks will be stationed around the venue to protect their stooges in Ohanaeze Ndigbo. We are certain that these Fulani armed men in uniform are under orders from whoever sent them to shoot people at sight. Any person could be an unintended victim of a stray bullet. When the pandemonium starts on Monday, a codeine charged Fulani army or police officer armed with AK 47 will not know who is who. Documented incidents of stray bullets killing innocent bystanders abound. If you don't want to be a victim don't venture into Awka on the 21st of May 2018. Therefore, we are warning those invited by Ohanaeze to stay away from Ekwueme Square in order to allow IPOB settle this issue of Hausa/Fulani collaborators and saboteurs once and for all time in Igboland. We don't want another meaningless restructuring debate that will lead to further enslavement of our people for another 100 years. If some individuals and groups are comfortable with their slave status in Nigeria they should permanently relocate to the North as some of them have done already. We the Indigenous People of Biafra will not be slaves in our own land. We will sacrifice everything sacrificeable, including our lives, to ensure we live as free men in the land of our ancestors as God intended before the white man came. Anybody equating what is about to happen at Ekwueme Square in Awka on Monday 21, 2018 with what obtained in November 18, 2017 Anambra governorship election is a very poor student of social dynamics. For starters, IPOB said it would boycott Anambra elections and it did so successfully. That less than 2% of registered voters bothered to turn out on polling day is testament to the persuasive clout of IPOB. That INEC even went ahead to announce a fraudulent result, more than 48 hours after the polls closed, is another indication that a great deal of time was spent falsifying the figures to make it appear respectable. However you look at it, IPOB boycott of Anambra elections was a resounding success. If not why the continued witch-hunt against IPOB before 2019 elections? Nigeria is a country conceived in fraud and sustained by a corrupt group of people that care only about themselves and their families, so it shouldn't come to anyone as a surprise that INEC announced a binding result based on less than 2% of votes cast. In a monumentally corrupt country like Nigeria, institutions like INEC will always announce a result regardless of electoral outcomes; a unique characteristic of any backward rentier dictatorial banana republic. In any other civilised region of the world, Anambra elections would have been canceled outright but we are in a place called Nigeria where a grand conspiracy is at play to deny IPOB every opportunity to make its case. Our consistency in confronting this crumbling corrupt edifice with our civil disobedience is what distinguishes IPOB from any other group. We will not stop until our freedom is achieved. Anybody responsible for the death of any indigenous person of Biafra on Monday in Awka will surely die. Ohanaeze Ndigbo should take note. Canelo vs Jacobs Livefor Free Broadcasting For Clicking On this hypered Text. Here is given the full gudline. You can enjoy the bout problem free.